A Hope and Life group visited one of nine single family orphanages that have been built by the International Orphanage Union (IOU) recently in Cochabamba, Bolivia. These wonderful homes each have Bolivian house parents who have committed to raising ten orphaned children in a family environment. Hope and Life is now providing the funds to build the tenth home! View photos from this trip. These photos show the missions group visiting a fully operational home, another that is in the process of being built, and the land on which our new home will be built from funds supplied by Hope and Life. 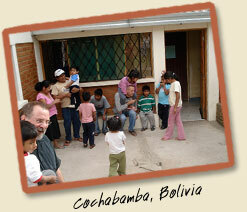 Visit the International Orphanage Union website.